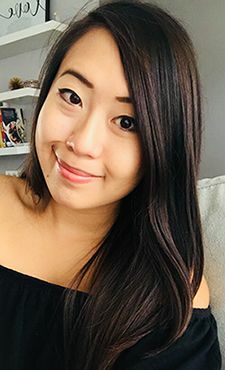 On my most recent trip down to Calgary for Phil's Birthday, I finally had the chance to try out a restaurant that everyone has been raving about! 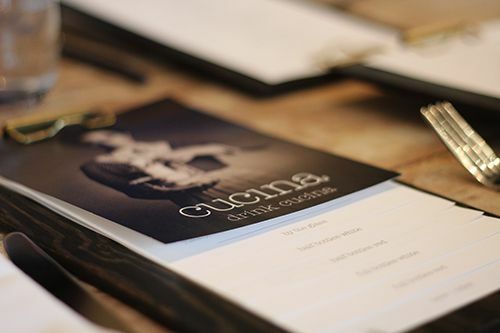 I first heard about Cucina from my good friend Carmen, and the menu was nothing short of drool-inducing. Under the direction of Executive Chef John Michael MacNeil and the Teatro Group, this place was high priority on my list of places to try. In a brightly lit space sits Cucina, a casual eatery with a strong Victorian influence, making me feel like I've been transported back in time to have brunch in a summer cottage. 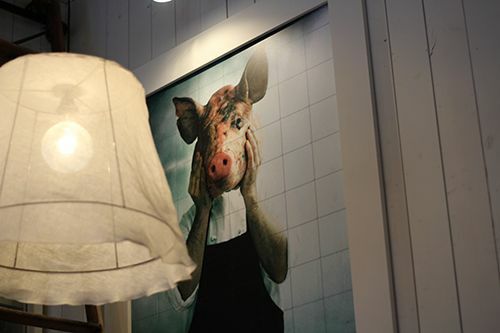 The furnishing and decor is carefully chosen to mimic country elegance, but there's definitely some quirkiness as well when I see the portrait of Chef MacNeil with a pig head. On this Saturday around noon, Cucina is bustling and full of activity. Tables full of happy patrons in both the bistro and grab & go sides of the restaurant tell me I'm in for a treat, and I really am - not just for the food, but my awesome partners in Crime too - Carmen, Diane & Teresa. To start off our meal, we were surprised when Chef MacNeil sent us an overflowing basket of baked goodies to our table. 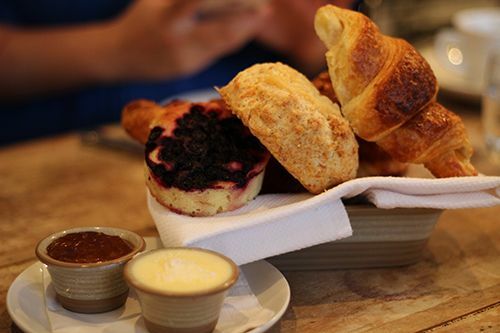 A berry cake, rosemary biscuit, fruit croissant, pain au chocolat, and raspberry asiago biscuit served with apricot preserves and salted butter.. all the pastries were flaky, buttery and full of flavour. I'm not usually a biscuit girl and I loved everything. Got a sweet tooth? 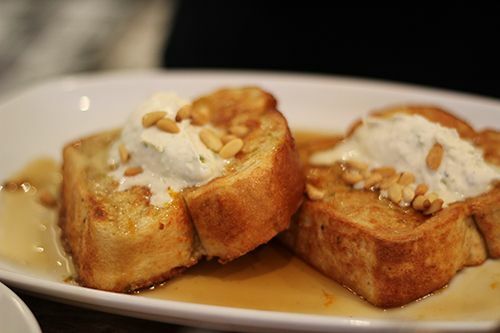 The French Toast ($14) was definitely whispering my name: maple-citrus gremolata, toasted pine nut, whipped mascarpone. Thick toast with a crispy interior slathered in mascarpone cheese was rich, but worth every single calorie. Which by the way, calories never count on Calgary food trips! 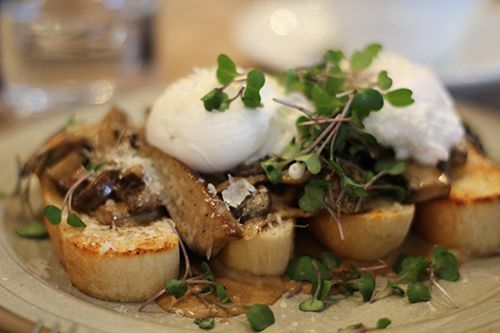 The Wild BC Mushrooms & Poached Eggs on Toast ($15) has quickly become a restaurant favourite: shallot-white wine reduction, black pepper, parmigiano, and for good reason, especially if you're a fungi (fun guy, oh, puns!). It's a savoury dish worth waking up for, and your stomach will thank you even if your sleep-deprived self will not. 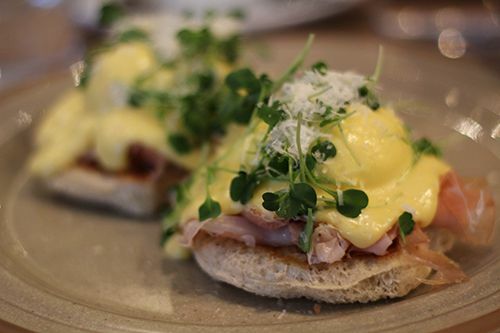 For myself on this particular day though, I had to go with the Benedict of the day: prosciutto, parmesan hollandaise, parmigiano, microbasil. Anything with the words prociutto and benedict usually catch my eye, and the combination didn't disappoint. The eggs were poached to perfection, oozing out a gorgeous bright orange yolk when cut into - seriously, most beautiful shade of orange I have ever seen in an egg! 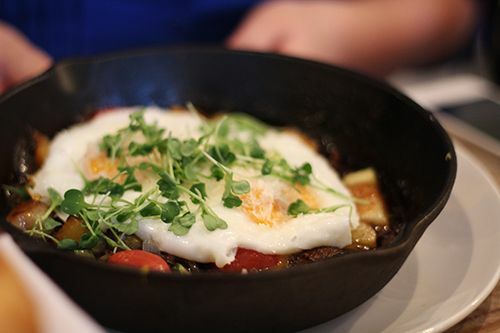 There is so much variety available on the brunch menu, but if you can't make it in time, there's always lunch and dinner service at Cucina too. Pastries, sandwiches and salads are available for grab & go purchases, and I'll be sure to stop by the next time I'm in Calgary to pick up some goodies. I really admire Chef MacNeil's innovative creations, and commitment to sustainability. There's been more than one occasion where I've seen him tweet about the herbs he's growing, or the offal he's playing with, and the restaurant's support for local producers and events is something to be recognized. 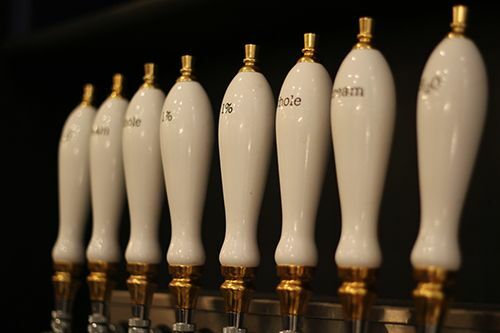 Having only been open since October 2012, Cucina Market Bistro has taken the dining scene by storm and isn't leaving anytime soon, if their popularity is any indication. 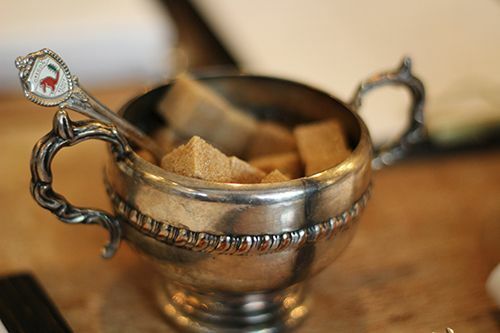 Wow, the sugar cubes are so beautiful! :) This sounds like a decadent treat. I love their attention to details with all the decor! Oh really lovely photographs all the food looks delicious! I'm salivating Andrea! I love French toast and those mushrooms & poached eggs look delicioso!!! HaHaHa Fabulous!